Around 252 million years ago, the Earth experienced its biggest mass extinction event. Now, scientists believe swathes of sea creatures were suffocated because of global warming. Experts in the field have long been puzzled by what caused the so-called Great Dying at the end of the Permian Period, which is estimated to have killed some 70 percent of land animals and 96 percent of sea creatures. Fossils lay bare the realities of this dark period: with a switch from a functioning ecosystem to piles of dead bodies. Various theories have been floated to explain the phenomenon. Some have touted the idea that temperatures were too high, or the water was too acidic, lacking oxygen or perhaps contaminated with metals or sulfide. But according to findings published in the journal Science, ocean creatures were wiped out at the end of the Permian Period because of global warming, which caused a loss of 80 percent of the oxygen in these waters. Scientists at the University of Washington and Stanford University modeled the conditions of the oceans and animal metabolisms in the Permian period, when the continents were grouped as Pangaea. They also assessed online archives of fossils that indicate where animals lived before the Great Dying, and their fate afterward. To mirror the greenhouse gasses released by huge volcanic eruptions in Siberia, the researchers heightened the temperature by 10°C. 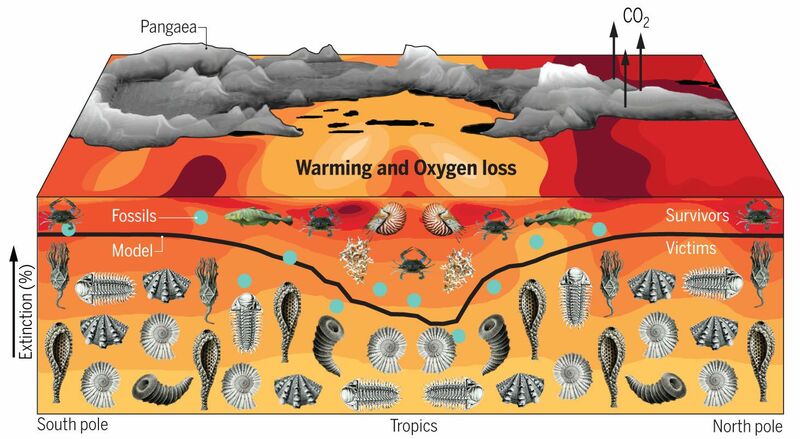 The “mechanism of climate warming and oxygen loss was a primary cause of the extinction,” concluded Justin Penn, first author of the study and a doctoral student in oceanography at the University of Washington. Tropical organisms, who were more used to warm, relatively low-oxygen environments, faired the best and were able to adapt to new habitats. But creatures in cold areas farthest from the equator were among the worst hit, the authors found. The study was published a day after scientists released the Global Carbon Budget 2018, warning levels of carbon emissions are set to hit a new record by the close of the year. They blamed the use of coal and more vehicles hitting the roads, but stressed levels could drop if efforts are made to cut emissions. Penn said: "Under a business-as-usual emissions scenarios, by 2100 warming in the upper ocean will have approached 20 percent of warming in the late Permian, and by the year 2300 it will reach between 35 and 50 percent.